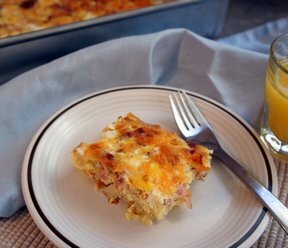 This tasty, golden brown casserole can be ready in less than one hour or you can make it the night before, chill and bake it in the morning. 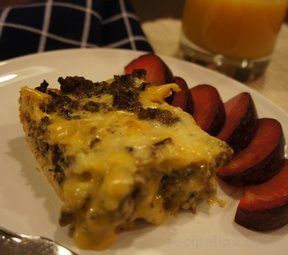 Choose lower fat cheese, milk and sausage for a lighter, yet still tasty version. 1. Preheat oven to 325°F. Cook crumbled sausage in large skillet on medium heat until brown, stirring occasionally. Drain sausage. Spread in lightly greased 11x7-inch baking dish. Sprinkle cheese over sausage. 2. Beat eggs, water, milk and Gravy Mix in medium bowl with wire whisk until well blended. Pour over cheese. Arrange bread cubes evenly over mixture. Drizzle butter over bread, if desired. Sprinkle with paprika. 3. Bake, uncovered, 40 minutes or until knife inserted in center comes out clean. 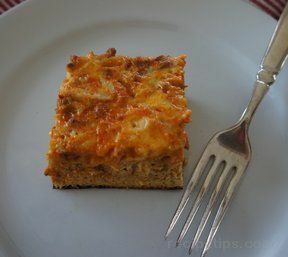 Let stand 10 minutes before serving.Make Ahead Tip: Cover and refrigerate unbaked casserole overnight. Bake, uncovered, in preheated 325Â°F oven 50 minutes or until knife inserted in center comes out clean. Serving Suggestion: Prepare additional package of McCormickÂ® Original Country Gravy Mix or Sausage Country Gravy Mix as directed on package. Serve with casserole.